The woman opened her eyes. Seeing Peter, she sits up, and he gives her his hand and lifts her up. WHEN THE DISCIPLES,or believers in Jesus, spoke of their fellow worshipers, they called them saints. For these men and women had hearts purified by faith in Jesus, and therefore they also lived holy lives, as true saints do. The apostles at Jerusalem were pleased to hear that there were many disciples, or saints, in other cities throughout the land. Sometimes they visited them and encouraged them to serve the Lord. Aeneas was glad to hear these words. He believed them, and when he tried to raise himself strength came into his feeble body at once and he was made perfectly well. This was the first miracle Peter performed at this place, and many people who knew Aeneas believed in the Lord. They met with the saints to worship God and to hear Peter preach the gospel story. In a city called Joppa, not far from Lydda, was another company of believers. Among them was a woman named Dorcas, who by her kind words and helpful deeds had brought gladness to many poor people. And every one who knew Dorcas loved her dearly. While Peter was stopping with the saints in Lydda, Dorcas fell sick. Soon her sickness became so severe that she died. Her death brought great sorrow to the hearts of her friends, for they thought they could not spare such a good woman as she had been. The saints in Joppa felt unwilling to have her taken away from them. They had heard that Peter was at Lydda, and at once they sent for him to come quickly. When the messengers returned from Lydda, Peter was with them. 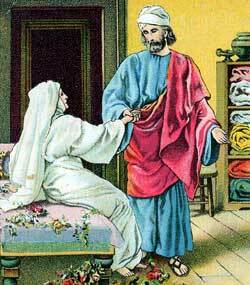 They brought him to the house where Dorcas had died and led him to the room up-stairs where she was lying. Many of Dorcas’ friends stood about him, weeping bitterly. And widowed mothers brought garments which Dorcas had made for them and for their children to show these things to Peter. They wanted him to understand how much they still needed this good woman to encourage them and help them out of their troubles. Peter knew what Jesus would have done in a time like this. He knew Jesus was touched with the sorrow of others, and his own heart, too, was touched. he commanded every one to leave the room, and when he was alone with the dead body he prayed. Then turning toward the body he said, “Tabitha, arise!” And the woman opened her eyes. Seeing Peter, she sat up, and he gave her his hand and lifted her up. Then he called the saints and poor widows to reenter the room. How happy they were to see their dear friend alive once more! The news of this wonderful miracle spread rapidly through Joppa, and many people became interested. When they heard the gospel preached they also believed in the Lord and were saved from their sins. And Peter stayed for a long time in this city by the Great sea, stopping at the home of a man who was called Simon, the tanner.